There’s been a lot of talk in the news lately about Drones and Unmanned Aerial Vehicles. Just recently a DJI Phantom Quad Copter Remote Controlled Drone crash landed on the White House lawn! See the New York Times Article entitled “Man Lost Contact With Drone Before It Sped to White House, Friend Says”. Click this link for the full story: http://goo.gl/QamJ2n Ouch! I’d hate to be “that guy”. 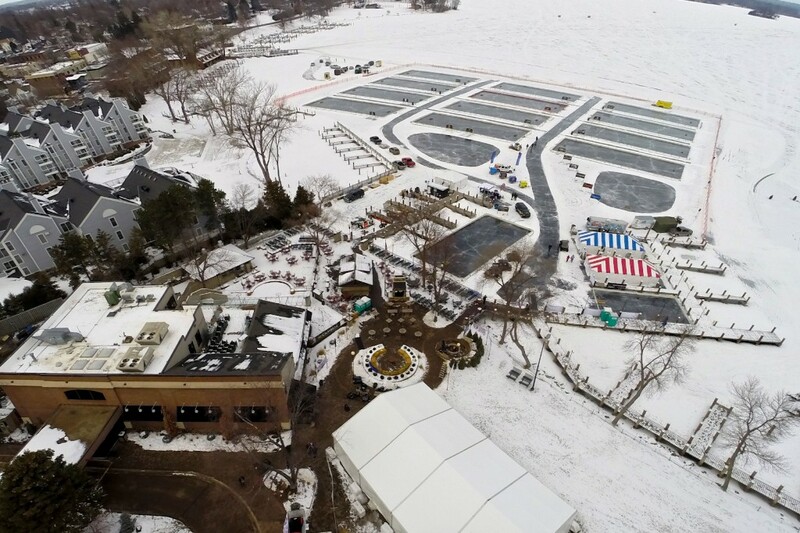 Aerial shot at the North American Pond Hockey Championships on Lake Minnetonka, Jan. 2015. GoPro Hero 3+ Black on a DJI Phantom Quadcopter with 2-axis motorized gimbal. Photo by Picture Time. Joe is right, and we agree that mixing wide-angle aerial footage, with medium and tight shots can improve visual story telling immensely. Watch a movie or look at a story on the evening news. In each case there is a nice mix of wide, medium and tight shots. Here’s an example of a recent piece we put together for the North American Pond Hockey Championships in January, 2015 http://goo.gl/Ykb43Q Fresh Sights helped us with the aerial footage and then we mixed angles and focal lengths to tell the story from multiple angles. One should think carefully about pursuing drone footage in their next project without taking into consideration licensing, safety, and insurance. Fresh Sights carries a 2 million dollar liability insurance policy and always carries out a pre-flight risk assessment and survey, prior to putting their bird in the air. Joe Grinnell says: “There are a lot of people going out and buying a drone and then flying them without having any knowledge of its safety features, rules, insurance, or having permission to be onsite at an event. This could pose a serious risk for the event as well as the safety of the people on the grounds.” So what are the rules? The FAA released a statement recently and although they say legislation is coming, there are still no definitive laws preventing the use of drones commercially. 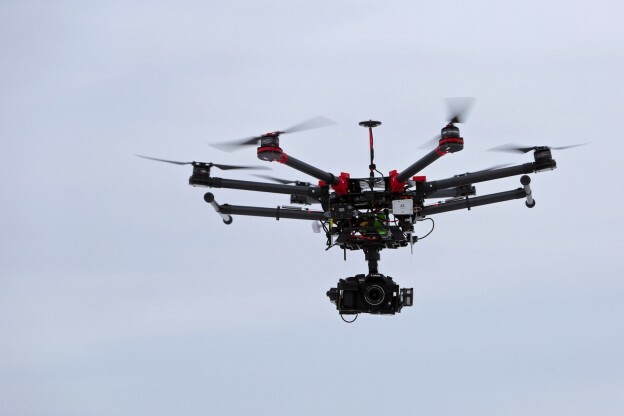 Here’s a recent article about some of the proposed rules: “FAA releases proposed rules for commercial unmanned aircraft” http://goo.gl/FOtbxg It appears that legislation and regulations are on their way but not much will change for those flying drones under 50 pounds. No matter what the rules are, common sense will play a big part in allowing the use of them to continue for cinematography and aerial photography. Here are a few common sense tips before you fly: -Practice! Fly your drone in a wide open area, free of objects and people BEFORE you fly near someone or something that could be damaged in the event of a crash. Familiarize yourself with the controls and make sure you experiment with the “return to home” feature, if equipped. What will you do if/when you get the craft disoriented? -Prepare! Understand local laws, regulations, and community ordinances before you fly. Even though the FAA may not be able to regulate non-commercial or LIGHT commercial drone flight, the locals can. Some communities, like Washington, D.C. for example, prevent unmanned aerial drone flight outdoors. -Police! With any new technology, there are skeptics. People hear “drone” and often get worried about spying and what aerial video and cameras might mean to their privacy and security. As a community if we self-police and are willing to call out those abusing the privilege of flying, we may prevent that call that ruins the opportunity for those who operate their drones responsibly. Be polite, respectful, and courteous to local law enforcement. -Produce! Create and produce epic aerial content and share it. The more people that see positive uses for this technology, the more we can expect widespread acceptance of it. We, in our limited exposure to the use of drones, have found great interest and acceptance of the craft! We hope to continue to produce epic content helping our clients tell their stories for years to come! If you’d like more information or want to consider adding aerial footage to your next project, or if you have questions or suggestions for future blog posts, please contact us today. We understand you are passionate about your story. At Picture Time, we’re passionate about helping you tell it. It’s an honor to share what we’ve learned with this community. Enjoy this blog? Thanks for spreading the word!